Nowadays, kids are attached to technology. Most of the kids have been making use of IPhones, IPads, Samsung Galaxy Tabs and even smartphones to spend their free time or for studying purposes. Some kids also make use of their parent’s devices for their own use. Everyone in this area has been troubled by the youth demands for technology except Apple. Big names such as Samsung and Amazon still seem to be confused about the youth technological requirements in the market. To meet this requirement these companies will have to do something big. Only Nabi, the kids educational tablet maker is doing the right task which is making good and big tablets for kids. These tablets come in very big sizes. To do this Nabi has changed Big Tabs a bit to make these new appearances. The sizes are of either 20-inch or 24-inch models. These sizes are similar to other devices as well. Those devices are Acer Z3-600, Dell XPS 18, HP Envy Rove, and Lenovo Horizon. These devices come in the category of Tabletop PCs. These devices are given the best possible features such as Windows 8 which is present in all the new models which makes them completely different from these Big Tabs. 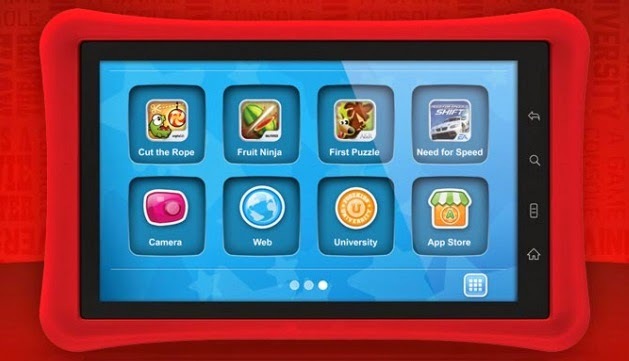 Android is the ideal operating system for these large tablets for kids. This is a tradition as Fuhu uses Android to power its Nabi educational tablets. These tablets are made kid friendly with nothing much difficult to use keeping in mind the present youth generation. For this it has done some alterations on the operating system, Android. It has made the Blue Morpho skinning on the OS so that the tablets remain easy to use for kids. The latest version of Android KitKat 4.4 has been installed on all the Big Tabs for an advanced era. These tablets are similar to some Android tablets to an extent but the main difference which sidelines the similarity is the size of the tablet. These tablets have two versions. The 20-inch version offers a resolution of 1,600×900, and the 24-inch model features 1,920×1,080, or full 1080p HD, resolution. These tablets make use of NVidia Tegra 4 processor and have 16 GB built in memory. The RAM memory is of 2GB. A Games Room suite has been included for games. There is also other software for classic games. Books, cartoons and much more is available for kids. There is a whole educational hub set up to facilitate the kids. The Big Tabs are not portable and require charging for a rougher use. They also don’t have an external SD card slot which limits the memory and supports parent’s supervision over their kids. The expected cost of these Big Tabs is around $449 for the 20-inch model and $549 for the 24-inch edition. These tabs are more expensive than all Android tablets and even an IPad which is not a good sign. These prices are not friendly for the parents to pay for their kids as other Android Tablets are cheaper and better in this era.